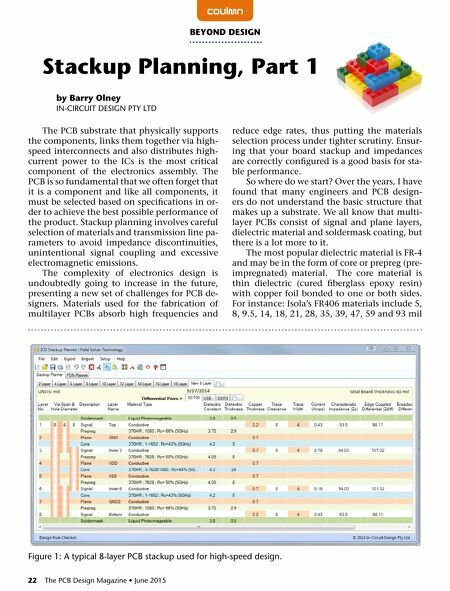 22 The PCB Design Magazine • June 2015 The PCB substrate that physically supports the components, links them together via high- speed interconnects and also distributes high- current power to the ICs is the most critical component of the electronics assembly. The PCB is so fundamental that we often forget that it is a component and like all components, it must be selected based on specifications in or - der to achieve the best possible performance of the product. Stackup planning involves careful selection of materials and transmission line pa- rameters to avoid impedance discontinuities, unintentional signal coupling and excessive electromagnetic emissions. The complexity of electronics design is undoubtedly going to increase in the future, presenting a new set of challenges for PCB de- signers. 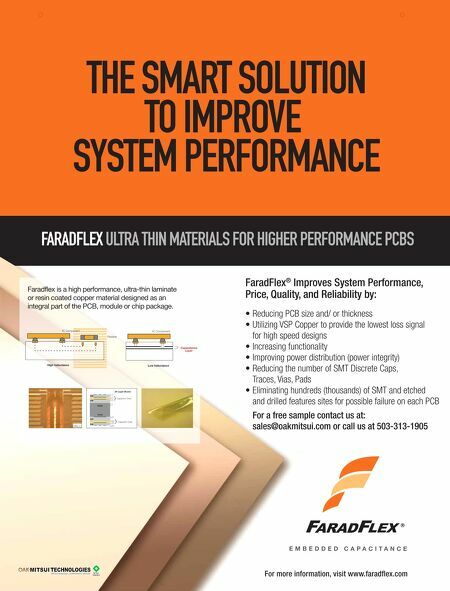 Materials used for the fabrication of multilayer PCBs absorb high frequencies and reduce edge rates, thus putting the materials selection process under tighter scrutiny. Ensur- ing that your board stackup and impedances are correctly configured is a good basis for sta- ble performance. So where do we start? Over the years, I have found that many engineers and PCB design- ers do not understand the basic structure that makes up a substrate. We all know that multi- layer PCBs consist of signal and plane layers, dielectric material and soldermask coating, but there is a lot more to it. The most popular dielectric material is FR-4 and may be in the form of core or prepreg (pre- impregnated) material. The core material is thin dielectric (cured fiberglass epoxy resin) with copper foil bonded to one or both sides. For instance: Isola's FR406 materials include 5, 8, 9.5, 14, 18, 21, 28, 35, 39, 47, 59 and 93 mil coulmn by Barry Olney In-CIRCuIT DEsIgn PTy LTD BEyOND DESIGN Stackup Planning, Part 1 Figure 1: A typical 8-layer PCB stackup used for high-speed design.